Submitted by Aunt Sharon on Mon, 06/30/2008 - 13:42. Submitted by eddiebeale on Sun, 06/29/2008 - 09:12. I was sitting reading The Fountainhead , and a cool breeze blew through the window. The breeze carried just a hint of Southern New England, but enough to transport me back over twenty years to a platform tent in Rhode Island, where my brothers and I spent the first week of the summer at Boy Scout camp - Yawgoog Scout Reservation. Submitted by calebelacnamdacadman on Mon, 06/23/2008 - 13:34. Submitted by arcdrummer on Fri, 06/20/2008 - 10:12. I coached my kids' baseball teams this year. At the end of the season the league has a picnic where all the players and families get together at a local park and eat burned hamburgers, hot dogs and warm potato salad. 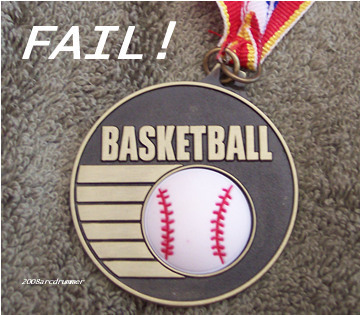 They also provide award participation metals for all the kids who played ball. Submitted by calebelacnamdacadman on Mon, 06/09/2008 - 07:46. Black swallowtail: Glad that I have lots of dill to thin out. Submitted by peggyrosewalker... on Sun, 06/08/2008 - 21:28. Hello Palmers! May I introduce myself? I am peggyrosewalkerlupone also known as Peg. I am Barbara Foerch Palmer's youngest cousin from the Walker side of the family. I have recently "finished" (if you can call it that) a Wacker/Walker family ethnography for my masters degree in oral traditions. Submitted by eddiebeale on Sat, 06/07/2008 - 22:42. Well, it was bound to happen if I stuck around long enough. I'm getting promoted, probably my last one. The press release has gone out, the new insignia have been purchased. Even the scrambled egg hat is ready to go. So Monday, 9 June 2008 is the fateful day. Submitted by grandma on Sat, 06/07/2008 - 22:28.
ins stride. I appreciated his behavior. Cassie et al have been haying. She mowed, crimped the hay and It Rained. Submitted by arcdrummer on Fri, 06/06/2008 - 13:54. This past weekend our family endured one of those events that many people experience in life... and one that highlighted where we stand in our natural lifespan. 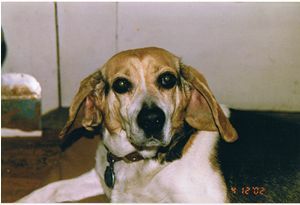 Our goofy little beagle Jasmine died. Actually, I think she died twice. 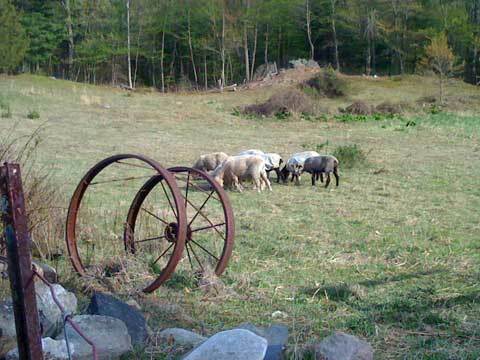 The "new" sheep pasture at The Palmer Family Farm. Submitted by Marthapb@hotmail.com on Mon, 05/12/2008 - 08:08. The pasture where Daisy and many other cows used to live has been unused for many years. Awhile ago discussion began about having sheep from "up the hill" come live here.Peter drew up a lease and preparations for this wonderful project began with Floyd trimming out tree and shrub growth along the fence line and in the pasture. He had help from Becky, Cassie and Spencer along the way. The fence was next and then..... ten sheep!!! !